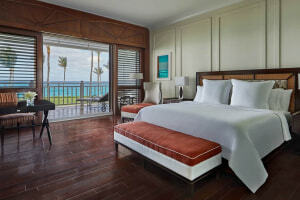 Set along the powdery white sands of Paradise Island, The Ocean Club is the place to be, to enjoy The Bahamas in style. Intimate and sophisticated villas, breakfast in bed embraced by the intricate and beautiful Versailles garden. Complimentary beach bags shall tempt you to spend all day by the waves while strawberries and champagne are brought to you every evening. The spa houses Balinese-style treatment rooms where you shall restore your vigor and glow while the natural Bahamian tropics and seclusion are healing to the soul. 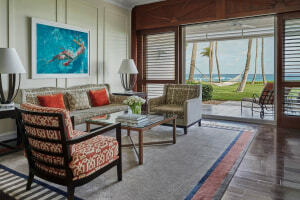 Three swimming pools, six tennis courts, and the Ocean Club Golf Course give you plenty of options to unwind with a sport while the various restaurants offer epicurean dishes after. Casino Royale fans - head over to the Martini bar and Lounge for that after-dinner drink. The Ocean Club offers pools for every type of guest with three different pools. The lagoon-style Family Pool is a hit among the kids and adults with a fun and refreshing waterfall. The Ocean Pool is perfect for that golden tan and lounging with a book while the Versailles Pool is an adult-only hideout enveloped by the exotic gardens of the resort. All children under the age of 16 should be accompanied by an adult when entering the Ocean Pool. Relax, unwind and revive yourselves at the Balinese-style villas amidst verdant foliage. Enjoy your own private garden and outdoor bath after your treatment. The treatment itself is deeply relaxing with aromatherapy and ancient Asian techniques to help you in your journey of wellness. Complimentary Yoga sessions are held at 08:00 AM every day at the Fitness Centre. Enjoy a complete Fitness Centre from Technogym Kineses systems and machines for your cardiovascular work-outs to an outdoor free-weights area where you can be inspired by the nature around you. Expert professionals are available to help you customize and enhance your session further. Dedicated rooms are provided for stretching and Pilates as well. Stunning views of the Nassau harbor and Atlantic ocean greet you at every turn of this championship Ocean Club Golf Course designed by Tom Weiskopf. An 18-hole course, it stretches over 7,100 yards with a course that offers challenges for even the most experienced golfers, making it an exciting game. Whether you are a tennis enthusiast or a beginner, the six Har-Tru tennis courts are perfect for you. For those who wish to fine-tune your game or catch some practice strokes, the resident pro will be more than happy to help. Three of the courts are also lit for night-time games. Carry a bottle of water to stay hydrated. Shop in style at the Carlo Milano boutique that has curated the best of treasures from the world's most coveted brands such as Céline, Hublot, Prada, Versace, and Tom Ford among others. Most of the major credit cards are accepted at the boutique. Dine in elegance at Dune as the Michelin-starred chef, Jean-Georges Vongerichten prepares innovative dishes blending French and Asian cuisine with the famous Bahamian twist. Overlooking the white sands, the setting is restful and quaint. In case of any dietary restrictions, kindly inform the staff in advance. Set above the Atlantic, Ocean is a casual dining restaurant with flavorful sea fare, freshly caught and made with local ingredients. Blending techniques and flavors is a specialty of the chef, who also ensures that the nutritious value of the meal remains. Set by the pool, the Versailles terrace is embraced by the tropical gardens and offers a French cuisine with a Mediterranean twist. Outdoor seating allows you to enjoy the sunshine along with the cool breeze. Adjacent to Dune, enjoy pre-dinner Bahamian cocktails at the Dune Bar along with light snacks and cuisines. Live music and ocean views make your experience an enchanting one. Enjoy custom drinks especially prepared by the expert in-house mixologists who are masters in their field. You can also sample the drinks of celebrities, including the Bond Classic - a Vesper Martini, shaken, not stirred. Kindly ensure that you must be above the legal age limit to order a drink at the bar. Allow your kids to enjoy their vacation at the complimentary kids club for children between 4-12 years. Trained professionals entertain and teach the children with activities, games, arts and crafts and exploration of the marine life. Kids magazines and customised iPods are available for the little ones at the Family Pool. The Ocean Club Golf Course is within a 3km radius of the property, with daily transfers available.